You've decided to go the DIY route without help from a moving company. However, there's still one small problem: you won't fit all of your household belongings in the back of your pickup truck. If you've never rented a truck before, it might be difficult to know exactly what you need and which questions to ask before renting. Read on for the 10 most important questions to ask a truck rental company. 1. Are there are any requirements for renting the truck (i.e. age requirements, credentials needed to operate the truck, etc.)? Depending on which truck rental company you choose, you may encounter different requirements for renting. For example, the minimum age required to rent a truck will vary based on which state you are in and which company you are renting from. Typically, the minimum age required to operate a rental truck is 23 years old, however this may vary so make sure you ask before you sign for the rental. 2. Who is allowed to drive the rental truck during the move? Moving is a difficult job and often requires help from several people-- whether it's packing your belongings, loading and unloading the truck or driving the truck to your new home. If you rent a truck you should first inquire about the company's policy regarding other people driving. Many times, truck rental companies will charge a small fee for adding additional drivers, so if you're planning on having someone else drive the truck, let the company know beforehand to be protected if something happens to the truck. 3. Is there a deposit required to rent the truck? It's always a good idea to ask about the deposit before renting and determine how much money is needed up front so you can adjust your budget accordingly. Some companies will place a hold on your credit card for a certain amount when you rent the truck, so if you're using a card to put down your deposit make sure the hold will not affect your ability to make other transactions. 4. Does my own insurance protect me while operating this rental truck, or am I required to purchase separate insurance? Your insurance protection while driving a rental truck will depend on what kind of auto insurance coverage you currently have. Some auto insurance companies will also protect you while driving a rental, as long as the rental truck fits a certain set of requirements. Also, some credit card companies will offer additional protection if you use their card to pay for the rental. Before you rent, contact your auto insurance company to see if you are covered by them, and also check your home insurance policy to make sure your belongings will also be covered while they're on the truck. 5. What kind of insurance and protection plans does the rental company offer? Each rental company will offer their own protection plans for anyone who is not already covered by their auto insurance or home insurance, or people who would like additional protection on their belongings. These packages are optional and are not required to rent the truck. However, it's a good idea to ask about them before renting to see if you could potentially benefit. These insurance plans are typically offered in stages with increasing levels of protection, depending on how much you choose to pay. 6. 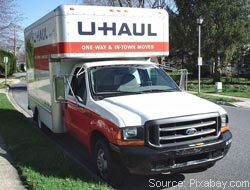 What size trucks do you have available and can I reserve a specific size for my move? The size of the truck that you rent is one of the most important decisions you'll make for your move. If you get a truck that's too small, you'll have to make more trips than you intended. When in doubt, it's always better to go bigger and err on the side of caution. Ask the rental company about which sizes they offer and which they suggest for your particular move. 7. What are terms for the length of time you can rent the trucks? Do you rent trucks by the hour or do you offer long-term rental leases? Are you renting the truck for a few hours to get your furniture from one place to another or do you need it for a longer period of time? You'll need to know the company's rental terms, how long they allow customers to rent their trucks, and whether they charge by the hour, by mileage or a flat-rate. 8. Where do I return the truck if I am making a long distance move? If you need to rent a truck to load up your belongings and drive it across state lines to your new home, you're not going to want to drive it all the way back to return it. Thankfully, most large rental companies will allow you to return the truck at another branch. 9. 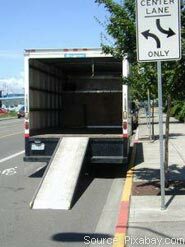 What should I do if something happens with the truck during the move or if there is a problem with the vehicle? Moving is difficult--and so is driving a big rental truck when you're used to driving compact sedans. Unfortunately, people make mistakes and accidents happen all the time, so it's a good idea to know what you should do if an accident occurs and the truck is damaged. 10. Do you rent any additional accessories such as moving equipment or towing hitches? If you're making a big move, a truck isn't going to be the only thing you need. You'll require some equipment like moving straps and dollies to load those big pieces of furniture and large appliances. Some rental companies will offer this equipment as add-ons, so ask about them when you go to rent the truck. What Size Moving Truck Do You Need for a One-Bedroom Apartment?